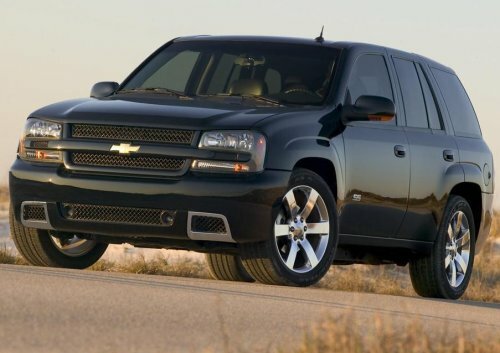 The National Highway Traffic Safety Administration has launched a primary investigation around 2006 and 2007 Chevrolet Trailblazer sport utility vehicles over a possible electrical issue inside the door panels that could lead to smoking or fires inside of the affected vehicles. According to the Detroit News, the NHTSA opted to launch this investigation after receiving 12 complaints about smoke and fire inside the doors – presumably caused by the power window switch systems or some other electrical components inside the doors. General Motors has announced that there have been no injuries stemming from this door panel fire risk and none of the vehicles involved in these 12 incidences have been destroyed. However, reports indicate that there was damage to the inner door panels and the seats. The NHTSA investigation of the 2006 and 2007 Chevrolet Trailblazer may include as many as 309,000 vehicles and as the investigation begins, the feds are focusing on the power window switches to see if they are the cause of these fires. The power window switch assemblies are shared with the a variety of other models including the GMC Envoy, the Buick Ranier and the Saab 9-7X models from the same year but it seems that those other models have differing door interior design, which could be the reason why these models share components but there have been no complaints about similar smoking or fire issues with the non-Chevy SUVs. The NHTSA recently began an investigation of the Toyota Camry and RAV4 for similar door fires stemming from the power window switches so the first step by the feds may be to see if Toyota and GM acquired any of their interior door electrical system from the same supplier. It is not uncommon for automakers to use the same suppliers for some products or components even when the vehicles in question are not related so if the NHTSA finds that there are shared components – the two investigations could take a very similar course. Should similar components be discovered, this could also help the NHTSA proceed with the investigation to figure out just what is at fault for the fires in both the 2006-2007 Trailblazer but also the Toyota models that are currently under investigation. If there is a faulty component or design issue with the 2006-2007 Chevrolet Trailblazer, the NHTSA may force GM to recall these models to address the fire risks and even though there have not been fires in other General Motors vehicles, if a certain item is found to be at fault, the investigation and possible recall could extend to other vehicles. TorqueNews will continue following this story, bringing you any breaking news as it becomes available. Hi, My name is Carrie Edwards. I just read the article about the electrical problems on the drivers door, burnt wires and fires. It happened to me. I own a 2006 Chevy Trail Blazer/Extended Cab. Of course I called my local Chevy dealer, and they said there was not a recall on my truck. I need to know who to contact. Thank You. Carrie Edwards My email is [email protected], Or you can reach me on my cell at 574-206-6246 Thank You. The same thing happened to my 2006 trailblazer and I called Chevrolet and they said there was not a recall on my truck. UTICA , OHIO Looking for who to contact also. Hello to all. My 2007 Trailblazer literally caught fire yesterday at 0550 hrs while I was on my way to work. Thick smoke began pouring out of the window switch holes. I took mine to the dealership and they said the same thing. I however went to the NHTSA website and filed a formal complaint in detail and I called the GM number from their website this morning. They created a file and said that someone from automotive technologies would contact me tomorrow (due to the time I placed the call). So if I were you I would do the same. A recall will be fueled with consumer reports only. Who do I contact a Chevrolet I had the same thing happen a fire in the door panel. What's is going to be done about this. I called Chevrolet back in October and have not heard anything? ?